Shopping for My Little Pony Car Accessories? Decorate your car like your favorite My Little Pony character! Made from automotive grade vinyls and UV laminates, just apply these Rainbow Dash graphics as desired to your car! Graphics can be adjusted during installation and removed cleanly, but they can not be reused. 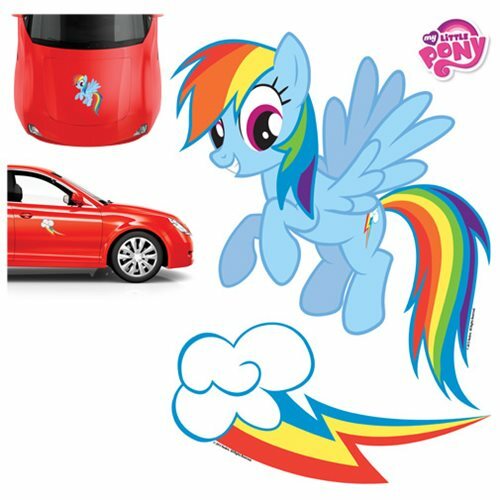 The My Little Pony Rainbow Dash Car Graphics Set includes 2 graphics, Rainbow Dash and her cutie mark. The Rainbow Dash graphic measures approximately 13-inches wide x 15 1/2-inches tall. Ages 13 and up.